To maintain constant concentration the ordinary size box can’t do it. 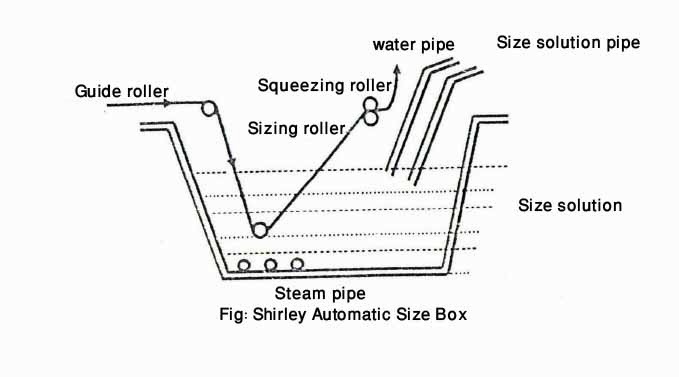 That’s why the Shirley automatic size box has been introduced with us. Purpose of Shirley Automatic size box: In the size box Shirley automatic size box maintain constant level of size solution and also maintain constant concentration per volume. 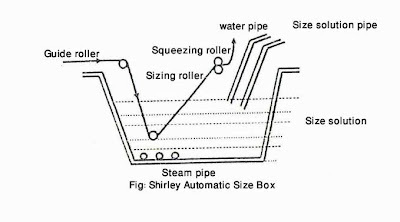 Construction of Shirley Automatic size box: To immerse warp yarn into liquor and squeezing roller to control size takes up% the Shirley automatic size box consists of an immersion roller. To control size liquor there are also a water pipe and also to control concentration there are a size solution pipe. 1. Through water pipe and size solution pipe, required amount of water and size liquor solution are added respectively. 2. To maintain the concentration when the concentration is more then just add water. 3. To maintain the concentration when the concentrations is less then just add size solution. 4. Via guide roller the yarn sheet is feed to the immersion roller and come out through the sizing roller and squeezing roller. 5. By the pressure of squeezing roller the yarn take up% is controlled.